After the success of their much-coveted collaborations, Tyler, The Creator and Converse return with another instalment to their GOLF Le FLEUR* range. Once again, Tyler has reimagined iconic Converse silhouettes, and they sit alongside a selection of street-ready apparel. By now, I’m sure you’re used to Tyler’s daring aesthetics, and this capsule is no different. The collection consists of three stand-out silhouettes and a seasonal half-zip jacket, the types of streetwear we’ve come to expect from Tyler and his individual style. 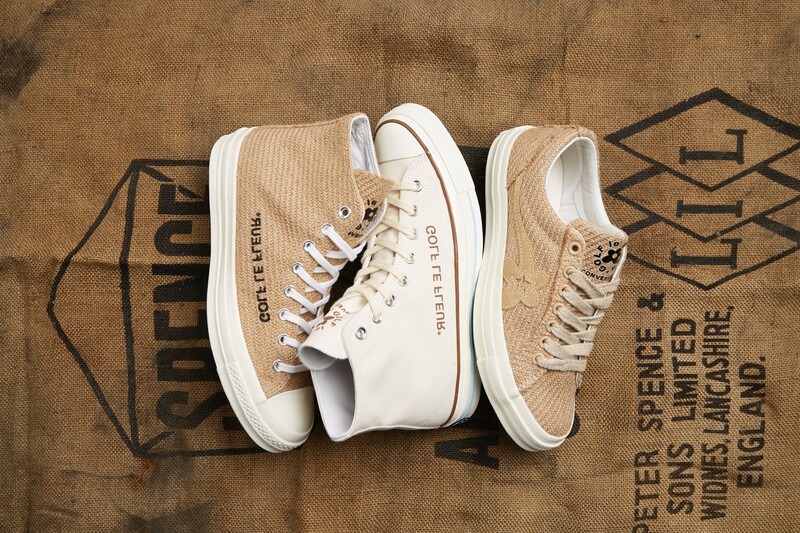 Coined the ‘Burlap’ (a type of thick, rough cloth) pack, the collection’s iterations of the Chuck 70 and the One Star Ox have been crafted using jute – a durable fabric used in the construction of burlap sacks. The second version of the Chuck 70 is reminiscent of a parchment colourway, trimmed with pops of brown and light blue piping. All the collection’s footwear is complete with Converse and GOLF Le FLEUR* branding throughout. The two half-zip jackets arrive in “Curry” and “Parchment” colourways. Crafted from premium fabrics, the garments are kitted out with an adjustable drawstring hood to ensure coverage from the elements, while a handy pouch pocket provides a useful space to store your essentials. Signing things off, both jackets feature trademark Golf Le Fleur* tagging to the front and back. The range will be available on the size? previews app and in selected size? stores on Thursday 15th November, with prices ranging from £80-£110.